Mycoplasma pneumonia (M. pneumoniae) is relatively small with few genes compared to other bacteria. It is a pathogen, a bacteria capable of causing damage to hosts, in this case, humans. It mostly infects lungs and causes community-acquired pneumonia (CAP) such as chronic asthma, but can also be responsible for some other chronic diseases such as Crohn’s disease, an intestine infection (See Figure 1). It acts as a parasite in host cells and mainly infects humans. This bacteria was first discovered in 1944 by Eaton et al. who analyzed sputum in tissue culture from a patient with primary atypical pneumonia. At this time it was known as the Eaton agent. M. pneumoniae is a mollicute, a bacteria that lacks a cell wall, leaving it vulnerable to desiccation and therefore it requires close contact with host cells for infection to occur. It is transmitted directly through people, where the bacteria is found in their nose, throat, trachea and sputum. In the body, bacteria infect epithelial tissues of upper and lower respiratory tracts and exfoliate the lung cells. They act like parasites, using host cell nutrients to survive and aid in producing glucose, a molecule used for energy for all organisms. The bacteria is responsible for primary atypical pneumonia. Contracting M. pneumonia induces slow development of symptoms 3 or 4 days after infection, such as pharyngitis or sinus congestion. Only 20 % of people infected by M. pneumoniae are asymptomatic. M. pneumoniae activates the immune responses and induces release of inflammatory molecules. Those molecules are in part responsible for developing chronic lung infections. 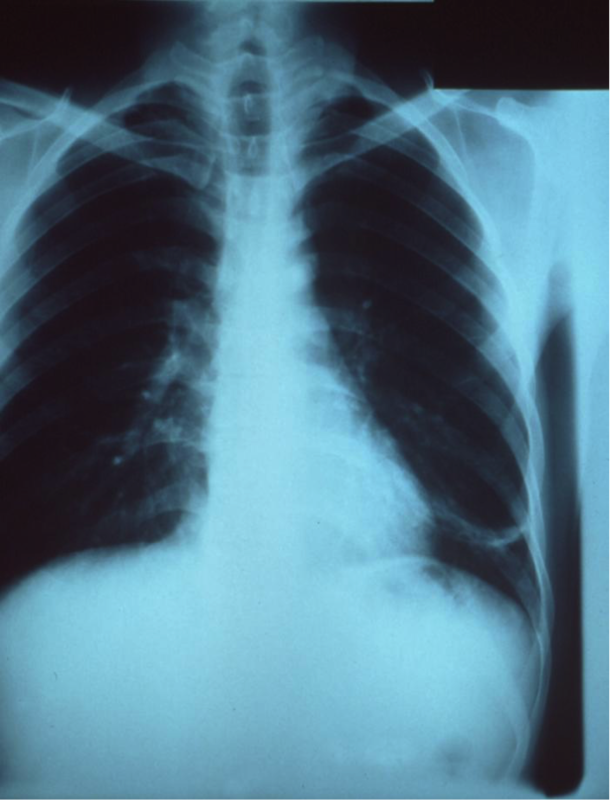 Any lung damage can persist for weeks and even months, post infection, or can be permanent after total clearance of lung abnormality symptoms. Individuals with allergic sensitization are more susceptible to developing chronic lung conditions after infection with M. pneumonia. M. pneumoniae is also linked to diseases such as pericarditis, inflammatory chronic diseases and auto-immune disease that can involve the nervous system like Guillain-Barre Syndrome. Because of its long incubation and transmission periods, and strong persistence in the body, M. pneumoniae infection can lead to prolonged endemics (local outbreak) and even epidemics (worldwide outbreak) in persons of all ages. Most outbreaks are initiated in communities such as military bases, hospitals, schools and families. 40 % of pediatric CAP are due to M. pneumoniae infection, 50 % among children older than 5 years old, and 18 % of these cases need hospitalization. In children, the most common syndrome is tracheobronchitis. However, adults are frequently infected by M. pneumoniae and are hospitalized for bacterial pneumonia in the Unites States. 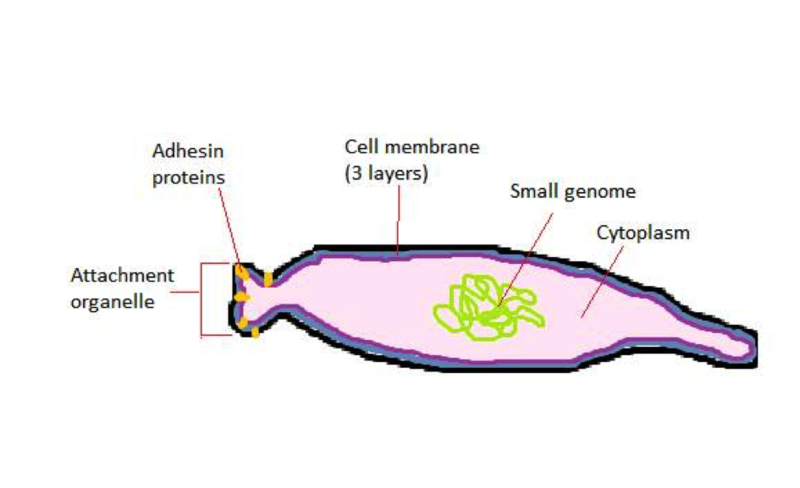 Figure 2: Representational drawing of a mobile M. pneumoniae bacteria, showing the main internal and external structures, with a simple cytoplasm, a very small genome, a cell membrane consisting of 3 layers, no cell well. The attachment organelle contains adhesin proteins that allow the bacteria to dock on the host’s membrane. M. pneumoniae is mainly extracellular, does not invade host cells, and lacks a cell wall therefore is highly dependent on the host for nutrients. The bacteria first attaches itself to the host lung cells: this is mediated by an attachment organelle, a structure made of adhesins, proteins that attach themselves to the host membrane (See Figure 2). Because of its molecular composition, the attachment organelle can undergo several mutations such that it is not recognized by the patient’s immune system (the defence mechanism of the body to protect it from pathogens) anymore and can proliferate in the body. This property of the bacteria is one of the reasons why it is difficult to treat patients infected by M. pneumoniae. Additionally, it secretes toxins which activate secretion of cytokines, molecules responsible for inflammation (See Figure 3). Once it invades host cells, it secretes a molecule called hydrogen peroxide, that reacts with the host molecules (reactive-oxygen species, ROS), destroying the cells of the respiratory tract. Finally, the bacteria hijacks the host’s immune system so that instead of protecting the patient against the bacteria, the immune system activity against M. pneumoniae causes damage to the patient. 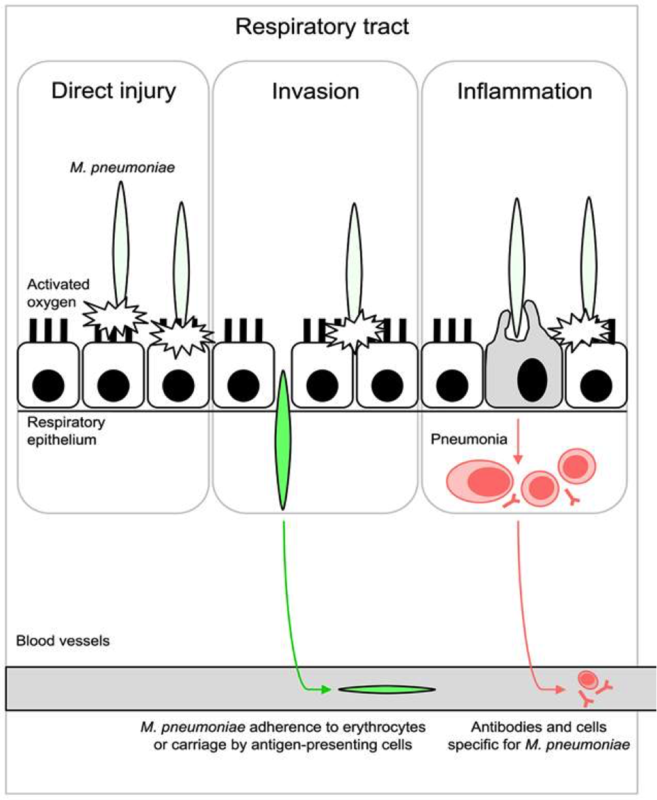 Figure 3 : Basic steps of M. pneumoniae invasion in the respiratory epithelial cells. First, the bacteria docks on the epithelial cell surface by its attachment organelle. It releases toxic molecules that produce a direct injury on the cell. Then, the bacteria crosses the epithelium layer, invade the tissues by entering the blood vessels. Finally, the immune system responds to the entry of the bacteria, resulting in inflammation. The fact that the bacteria does not have a cell wall contributes to its resistance to beta-lactam antibiotics, a common drug used against bacterial pathogens which normally target components of a bacteria’s cell wall. Instead, patients are treated with macrolides, which target bacterial proteins that mediate metabolic activity, faltering the bacteria’s metabolism. Fluoroquinolones and tetracycline are stronger and more effective alternatives, but have side effects that may be fatal or quite harmful to the patient. As result they are avoided and nearly never used on young children. However, the bacteria can become resistant to macrolides. When the bacteria causes too much damage to the host, for example destruction of respiratory cells and red blood cells, corticosteroids may be given. In severe cases, a blood transfusion may be critical. Asthma or increased asthmatic symptoms from this disease is to our knowledge either incurable or eradicable with the removal of the pathogen. Eaton MD, Meikejohn G, Van Herick W (1944). Studies on the etiology of primary atypical pneumonia: a filterable agent transmissible to cotton rats, hamsters, and chick embryos. J. Exp. Med. 79:649–667. This entry was posted in Uncategorized on November 23, 2015 by lfossecave.